A larger and bulkier cousin of the two post car lift, four posts give you extra strength and utility when working on vehicles. They can help take a lot of stress and effort out of your work, enabling you to access the underside of a vehicle without needing to lie down on your back all day long. This can help make your work easier, while also helping you get more work done faster. However, choosing the proper lift to fit your garage and needs can be difficult. Whether you are a professional, high-volume shop or a family owned business, there are many factors which can help you narrow down your selection. Take a look at some of our best tips in this four post car lift buying guide. One of the big benefits of four post lifts over their two post counterparts is the ability to be mobile. Two post lifts must be anchored to the floor, but four post lifts can operate freestanding due to their extra stability. Consider how strong your flooring is, and whether or not you can afford to anchor your lift into the ground. If you are unable to anchor or simply want a lift that is less permanent, look for four post lifts that do not require the extra support. If you want to work with the heaviest vehicles and have the most support, anchored models will be the right choice. There are many four post lifts dedicated to providing extra storage space to a garage that is tight in space, but needs to house vehicles for extended periods of time. Look for storage lifts if you have a need for extra parking space, as they will allow you to create two parking spaces in one. This can help you make the most of your garage and ensure you are always well prepared for whatever work comes through your doors. Keep in mind what vehicles you intend to work on. If you simply perform maintenance and repairs on consumer vehicles and don’t need to work on vehicles larger than trucks and SUVs, you have a wider range of options available to you. However, garages that regularly service commercial vehicles can find heavy duty four post lifts to accommodate their needs. There are lifts that can handle buses, large trucks, and more with longer lengths that will make the job easy. Make sure you are prepared for whatever vehicles you intend to work on so you can get work done easily. Most lifts can handle a variety of work, but many four post lifts work by supporting the vehicle with a bed that the wheels rest on. 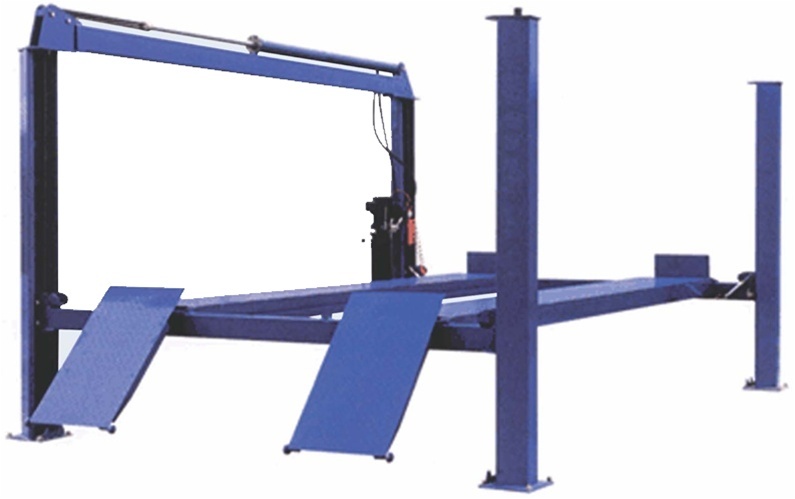 This means that it can be difficult to work on wheels and alignments without the use of additional equipment. There are specially built four-post alignment lifts, however, which will give you the additional freedom you need. Choose from a wide variety of lifts that range in capacity up to 25,000 pounds and more and ensure you can work on any vehicle that comes your way. Have more questions on 4 post car lifts? Give our experts a call today!